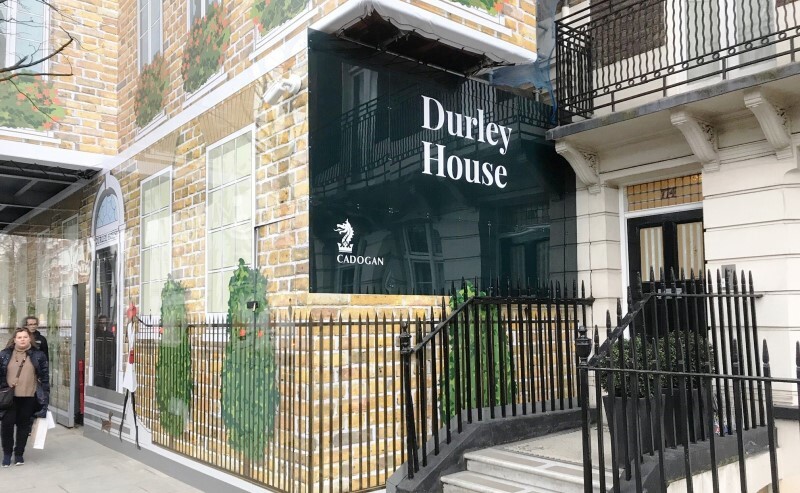 THE DEVELOPMENT Significant renovation is underway at Durley House on Sloane Street at the centre of the community in Chelsea. 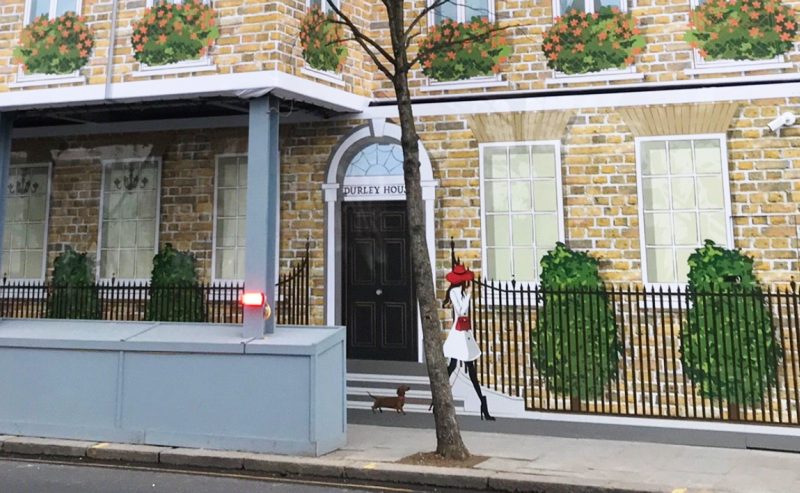 The 14,000 square feet London property was originally two Georgian townhouses which are being converted into a neighbourhood restaurant and bar with 15 private residence-style townhouse suites above. The Georgian façade will be restored to enhance the character within the conservation area and setting of neighbouring heritage assets, including the Grade II listed Cadogan Place Gardens located directly opposite. 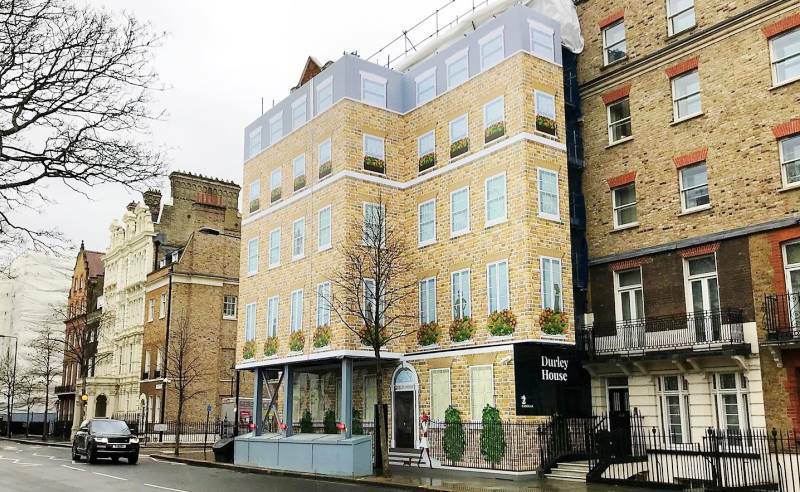 THE BRIEF In order to deliver the renovation a triple-storey temporary building was installed in front of Durley House. The unsightly heavy steel structure housed welfare cabins and site offices. 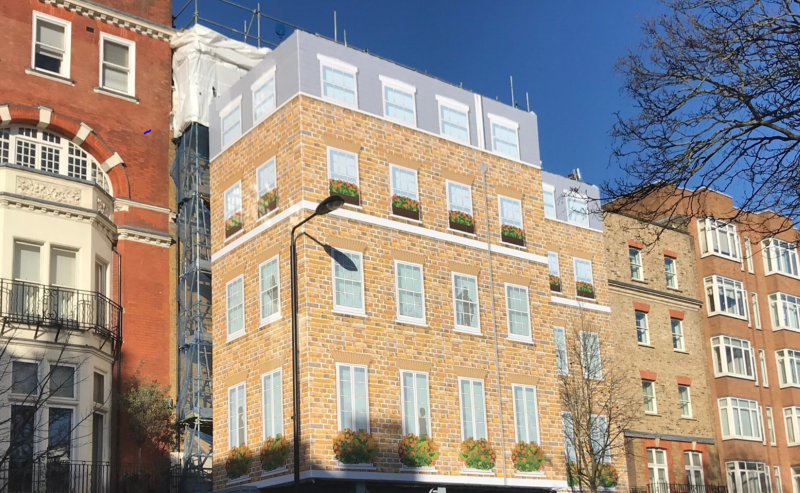 Cadogan Estates appointed Embrace to completely conceal and ‘hide’ the structure to minimise any disruption and maintain a positive and desirable looking environment for people passing by despite the renovation works taking place.  THE SOLUTION Following our site survey the Embrace team developed a series of precise templates that would deliver the perfect solution for our client. 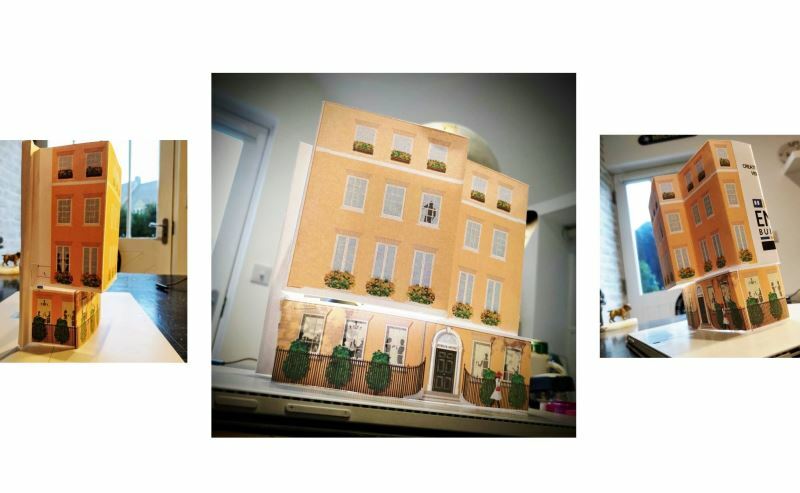 We carefully delivered an accurate scale model that assisted in the detailed planning stages before rescaling to full size ahead of the print and install. 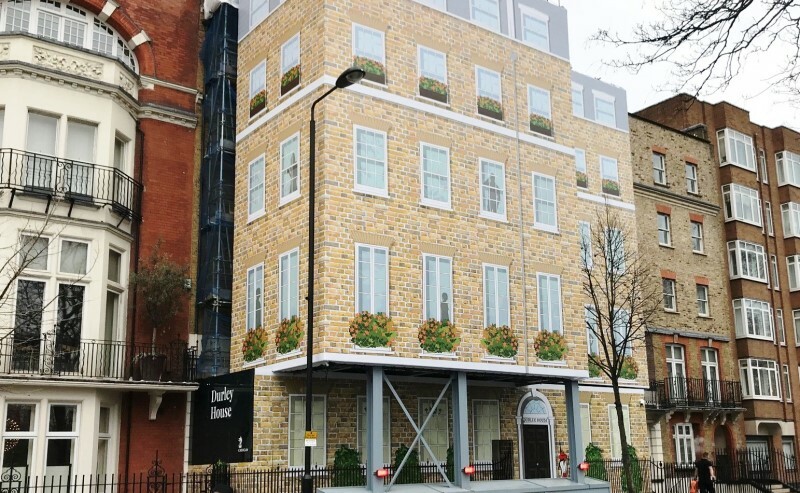 The main solid PVC printed cabin wrap covered the building façade and scaffold infills from a single sheet across five elevations (due to three perpendicular returns across its length). This was installed precisely using a banner frame offset from the temporary structure, working very closely with the main contractor McLaren Construction. We applied high gloss DIBOND site hoarding graphics at street level to create a premium quality finish appropriate for the client’s brand and the neighbourhood. For a seamless end result we perfectly aligned the artwork on the three site hoarding sections to the five elevations of the printed banner above with just 50 mm distance between both components. The final installation was delivered on time and on budget, standing at a combined 13 metres tall and successfully transforming the environment for our considerate client.